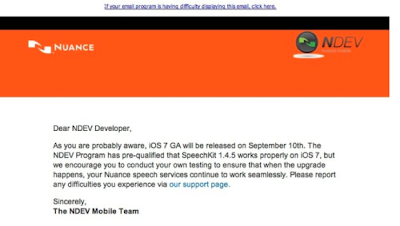 Believe it or not, the new iOS 7 will be released on September 10 of this year as per the rumors and the below mail which was sent to one of the developers named Owen Williams. 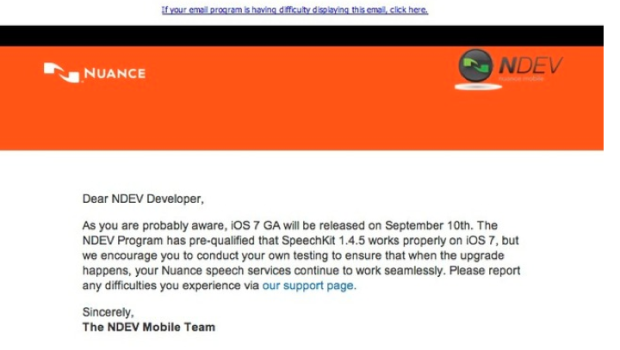 The contents of this email advises the developers to do their own testing on Naunce speach services (the company that works with Apple on Siri) in order to ensure the functionality of the new iOS, as they are all aware that the new iOS will be available to the public in September 10th. I am extremely excited for that day! What about you?